1. Show what statute written by the Congress of the United States that requiring Americans to file an income tax "CONFESSION" (return) and pay an income tax. 2. Show how Americans can file an income tax "CONFESSION" (return) without giving up their 5th amendment right to not give any information to the government that may be used to prosecute them. There is no statute that makes any American Citizen who works and lives in the United States of America liable or responsible to pay an income tax. Individuals only become liable to pay the income tax when they "VOLUNTARILY" file a tax return and the IRS follows their assessment procedures as outlined in the Internal Revenue Code. The IRS, under the United States Constitution, cannot legally require information on 1040 returns from individuals. This is the reason the IRS continually refers to the income tax as "voluntary." www.freedomabovefortune.com This is the site of Joe Banister, the former gun-carrying IRS Criminal Investigation Agent, who resigned from his prestigious job with the IRS because his superiors would not answer his findings of fraud within the IRS. (See this page.) 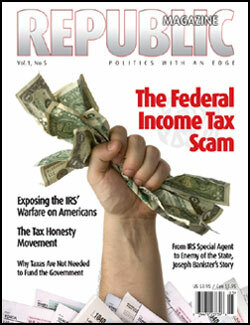 Mr. Banister's report on the IRS confirms our opinions about the Federal Income Tax in great detail. www.givemeliberty.org Bob Schulz, founder of We The People Foundation, has attempted several times with Joe Banister and many other intelligent Americans, to debate the legality of the income tax system with high ranking government officials. Each time, no government official ever showed up to debate! Any intelligent American would think the government would be more than happy to show up and answer a few questions to set the record straight once and for all, wouldn't you...? Or does the government have something to hide...? Do your own research and decide if the government is hiding something. See this page. Also see the DVD "America Freedom to Fascism" at www.freedomtofascism.com.